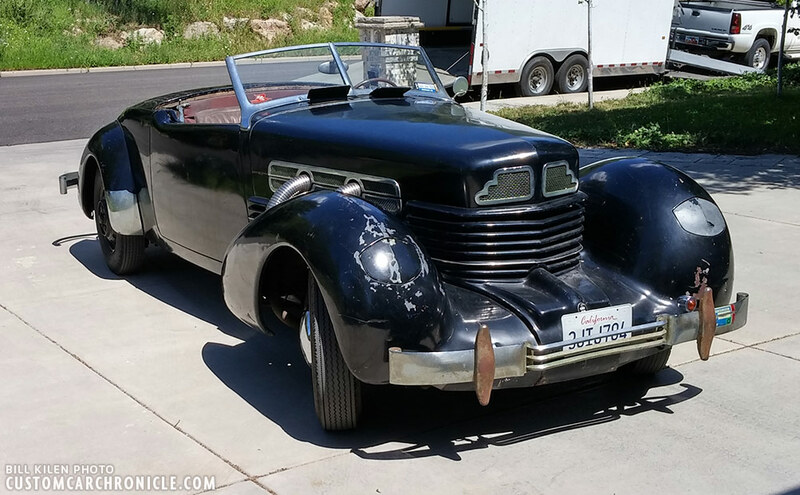 This Custom 1937 Cord was bought by the previous owner in 1956 and he kept it till 2007. But so far there is no info on who Customized it prior to 1956. We need your help. 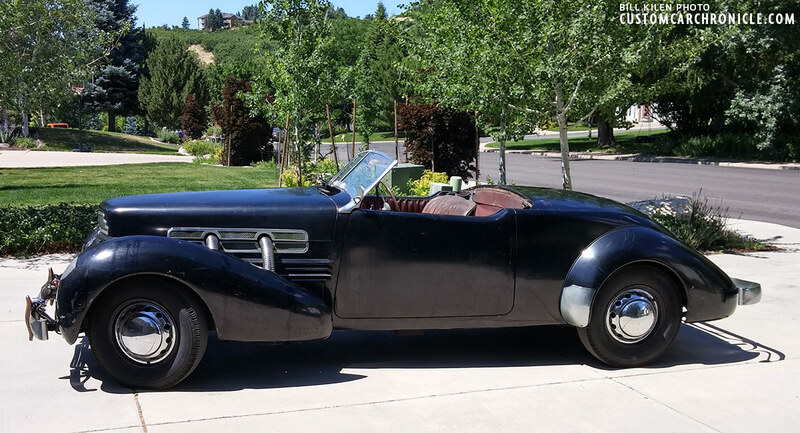 In the Summer of 2018 Bill Kile bought the 1937 Cord Custom you can see in this article. 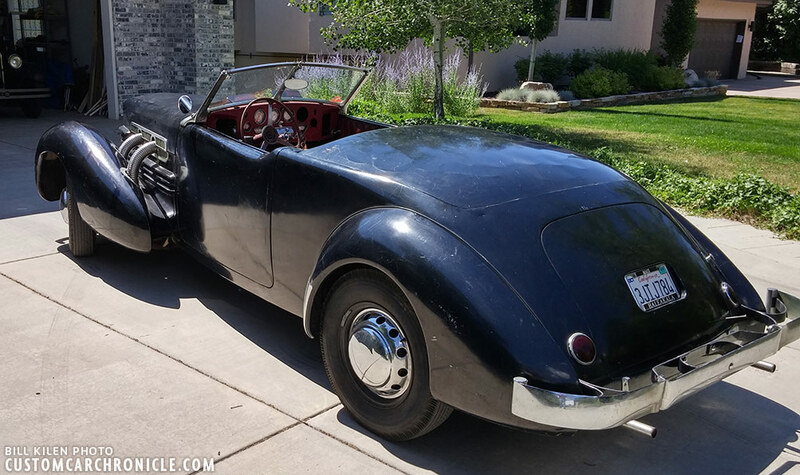 He had been very interested in if when he found out it was for sale and had been looking at it for some time and tried to come up with some history on the car to help him decide if he wanted to buy it or now. 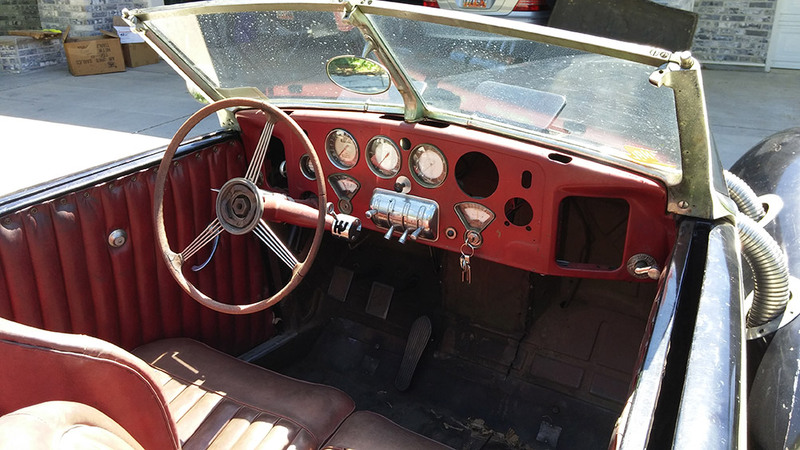 Even though he was unable to find any history, all the evidence he had seen indicated that the Custom Restyling on the car must date back to at least the early 1950’s and more likely even earlier than that. 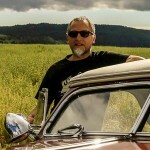 So in the end he decided to acquire the car and plant to restore it, over time, to how it looked as an original custom, or at least as close as possible, since so far there have not been found any photos of how the car originally looked like. And here we have one of the reasons why we wanted to do an article on this Cord Custom… To see if we can help Bill find more info, and hopefully some old photos of this unique Custom. 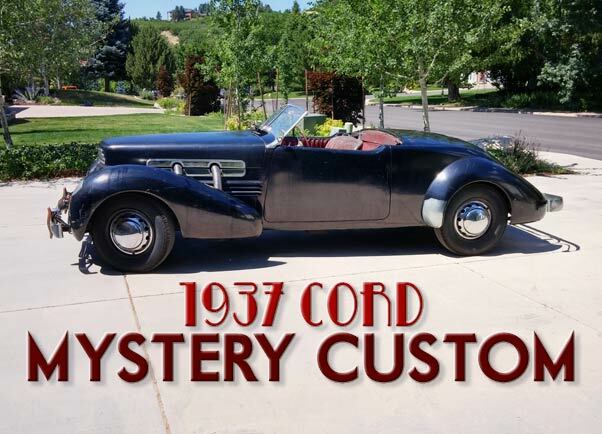 Back in the day most Customs were based on the more cheaper production cars, so a Custom Cord is a bit of a rarity. There were done more, and some even made it into the magazines. But with the rather high price on the Cords, they were not just for everybody a good base. If it turns out that the car has been Restyled in the late 1930’s or early 1940’s then most likely the owner who had the work done might have had some good money to spend on it. From what can be seen on the car the workmanship used in Restyling the car was very well. The vents on the nose of the hood were a Cord dealer installed option to provide additional air flow to the radiator. Most likely these vents were installed when the car was first purchased. The 1937 Cord phaeton has been “mildly and tastefully” customized. 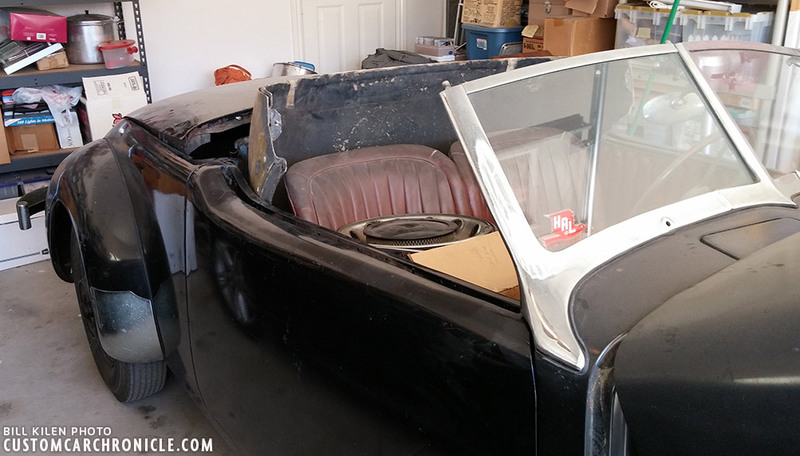 The top of the doors have been cut down and beautifully reshaped with a “Darrin dip” to help with the roadster look. The cut-down doors are all metal, and there is no evidence of a large amount of fiberglass or lead. 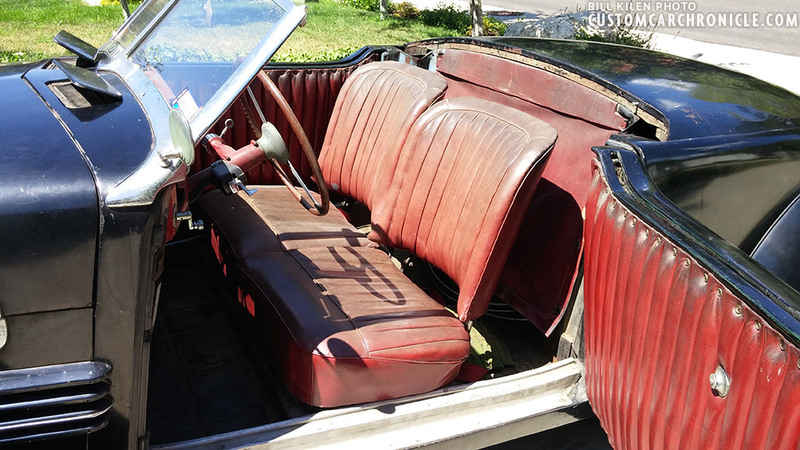 The rear seat has been covered by a hand made deck/cover to make the car a two seat roadster. The cover is made over a wood frame. The edge of the metal is nailed to the frame as was the case in many cars in the late 1920’s and early 1930’s. 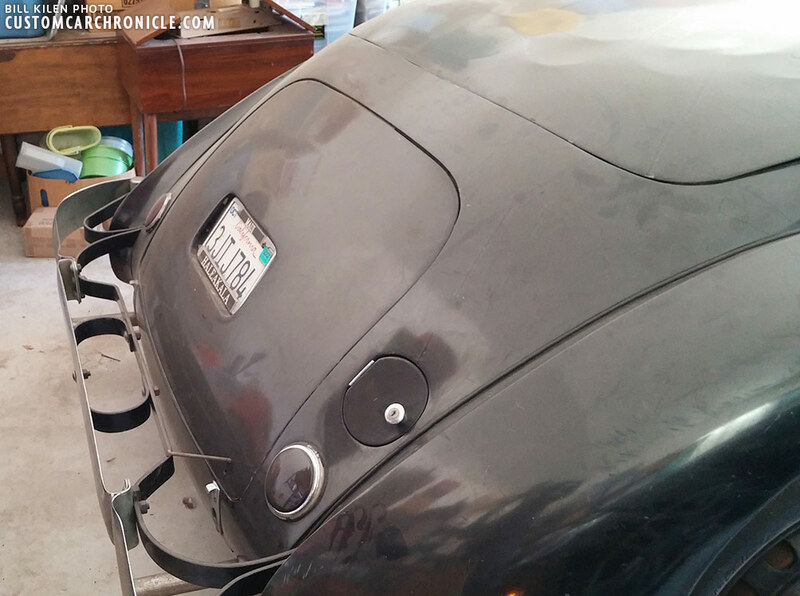 The deck lid is attached to the hinges that originally supported the lid that covered the convertible top. The car has no convertible top at this time. The door handles are removed. The license plate is frenched into the trunk. At one point a two piece custom fiberglass top was made to fit the car. The front portion that mounts to the windshield and that covers the front seat area is still with the car, the rear portion is missing. It looks like it was in two pieces that were hinged together. The missing piece contained the rear window. Possibly the top was designed to fold and fit in the space under the rear deck. The back top corner of the roll up side windows have a large radius, that must have been modified to fit the new top. All the photos of Cords that I have show a square corner. The license plates currently on the car are California plates with 2007 stickers, indicates that the car still might have seen some road time about a decade ago. The side view makes me wonder if the Custom, when originally restyled might have had white wall tires, and perhaps had a padded top that was later replaced with a more practical two piece fiberglass top. This photo shows how the cut down doors help with the streamline and flow of the Cord. A friend of the Bill, who has been in the car restoration business for 40+ years looked at the car. The custom work on the doors and the rear deck is very good. He is of the opinion that this work was done in the late 1930’s or early 1940’s. The doors appear to have been reskinned when the “Darrin” dip was added. And most likely the door handles and convertible top hardware were shaved in the early 1950’s. The frenched in license plate was most likely done at that time. One can see the sheet metal patches that were fastened to the underside of the door skin metal to cover the door handle holes. If the handles had been removed when the doors were originally customized, the door handle holes would most likely not been made when the doors were reskinned. Along with the car came some documentation that shows the car was purchased by a previous owner in 1956 in Burbank, California. Most likely the that the custom work was completed prior to 1956. The car was owned by the same gentleman from 1956 to 2016. Bill has corresponded with the gentleman’s son. He reported that the car was always garaged and mechanically maintained. 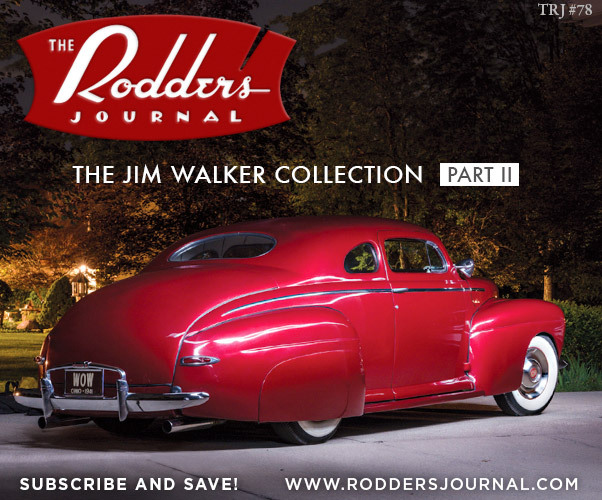 He believes that all of the custom work had been done prior to his father’s purchase of the car in 1956. The shaved door handles, custom made seat cover and set-in license-plate make the Cord look very streamlined and smooth. The seats may be the original seats from the Cord with new upholstery. The door upholstery is just as the seats not original. At this point Bill thinks the upholstery was done in the 1950’s. A closer look at the “Darrin dip” and the front of the custom back seat cover and its wooden frame. The engine is the original engine manufactured by Lycoming. 289 cu.in. The engine was originally fitted with a supercharger. 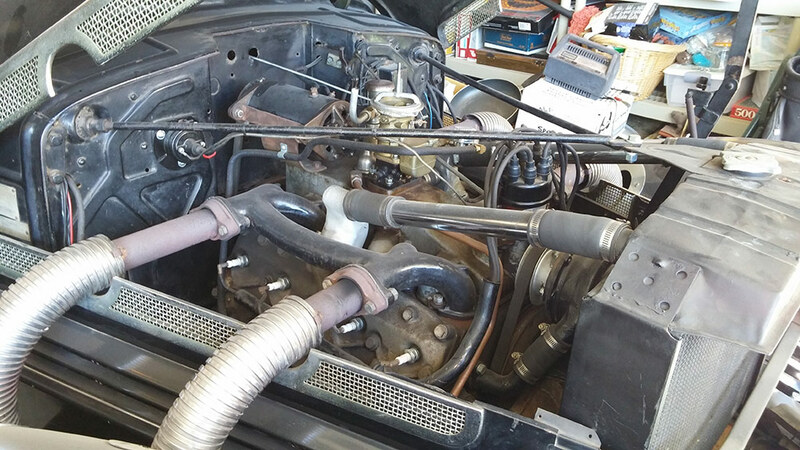 The supercharger was removed and the engine is fitted with the non-supercharger intake manifold. The receipts that Bill has lead him to believe the engine was rebuilt in the late 1950’s. 1937 Cord Model 812 Car serial number and body number indicate that the car was originally a phaeton with a back seat. The engine number stamped on the engine matches the engine number stamped on the car name plate. The engine number indicates that the engine was originally fitted with a supercharger. The supercharger was removed, most likely prior to 1956. Bill heard that the superchargers were problematic and that it was not uncommon to remove the supercharger. The engine runs and Bill was able to drive the car on to the trailer to haul it home. He is rebuilding the brakes at the moment and will check out the drive train next. 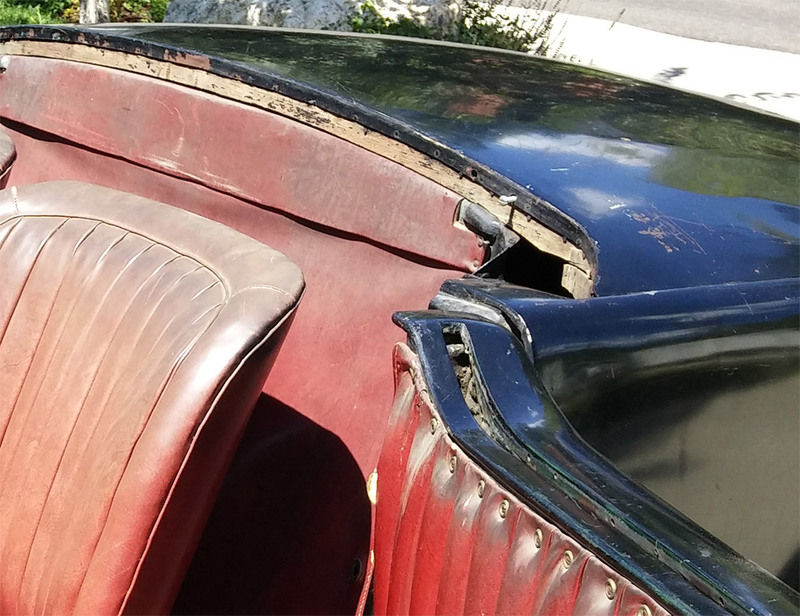 The body has some dents, but is in relatively good condition for an eighty year old car. The paint is in poor shape with many chips and scratches. The current plans are to put it back in good operating condition and drive it to local shows. A new paint job is planned after the mechanicals and electrical are sorted out. The good thing is that Bill does not plan to restore the car to original Cord condition. He will maintain the car in its current configuration and represent it for what it is, a Customized Cord. The front fiberglass top section temporarily stored behind the seats. Sunken license plate, and the back portion of the back seat cover. The history of the car prior to 1956 remains a mystery. Bill has researched the Antique Automobile Club (AACA) library’s files on Cords and on coach builders in the Los Angeles area. He has found no pictures of customized Cords with the Darrin dip in the doors. Bill believe there were at least four coach shops in the LA area that were doing this kind of custom work in the late 1930’s. He has contacted the Auburn-Cord-Duesenberg Museum and they had no information on this particular car. 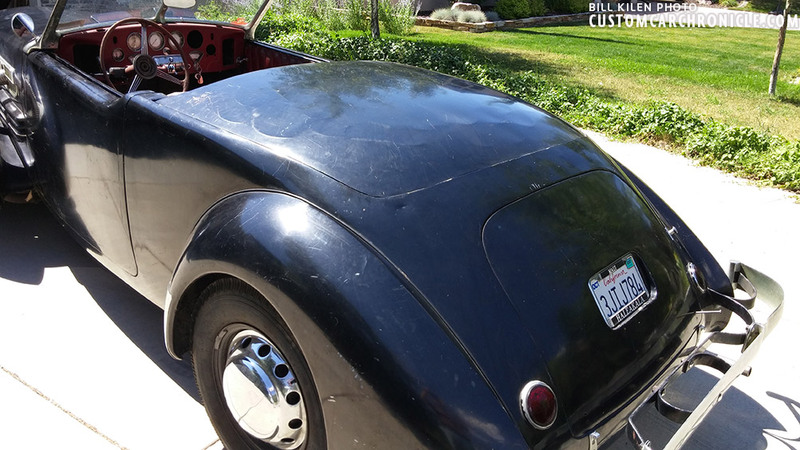 So, Bill is out of ideas for researching this car’s history, and hopes that perhaps one of the Custom Car Chronicle readers might know more on his Custom Cord’s history. I have checked in all my files, but have not find anything either. Lets hope somebody knows more, if you do, please sens us an email, and we make sure Bill will hear and or see all about it.